In an effort to get the best value, create a competitive environment for concrete and asphalt paving industries and promote innovation, MoDOT requires a concrete and asphalt option on the majority of contracts containing full depth pavement greater than 7 inches. If the combined total of all full depth pavements is greater than 14,000 square yards or a quantity of 7,500 square yards of continuous paving, the pavement project shall be set up as alternate pavement. Continuous paving is defined as one continuous, monolithic piece of full depth pavement with no breaks. Alternate pavement requires a Life Cycle Cost Adjustment (LCCA) factor be calculated and applied to the asphalt alternate. If the full depth quantities do not meet the threshold for alternate pavements, the full depth pavement should be set up as optional. Life Cycle Cost Adjustment (LCCA) is a monetary value calculated for each group of alternates in a project and provides a way to fairly compare the bids received. The LCCA value considers future treatments that are routinely applied to concrete and asphalt pavements. Treatments considered for asphalt pavements are cold milling and overlay of the traveled way only at 20 years and of the entire surface at 33 years. Treatments considered for PCCP are pavement repair and diamond grinding of the traveled way at 25 years. 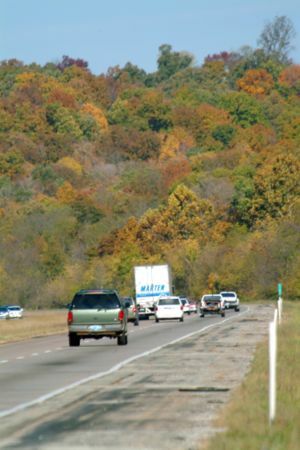 The treatment types and timeframes used for calculating the LCCA were jointly agreed upon between MoDOT and contracting industries. The following figures show how the LCCA is applied. MoDOT’s estimators prepare LCCA factors for inclusion in the contracts' Job Special Provisions for projects containing alternate pavements. The latest published real interest rates from the United States Office of Management and Budget will be used to bring the future costs to present worth. An LCCA factor will be calculated for each set of alternates in the contract,. This will allow contractors flexibility in bidding thus enabling use of the best valued material for the regional market. While each project has the possibility of differing slightly from any other project, there are some general guidelines to consider when setting up alternate categories. When alternate pavements are required, the project should be evaluated to determine how to set up the alternate paving categories. Alternate pavements that have areas with different surface mix types (SP or BP) should be in separate alternates. Typically areas that would be constructed in a separate paving operation should be set up as a separate alternate, such as side roads and city streets. Ramps should be placed with the highest priority route or with the like pavement type. Shoulders - If it has been determined that alternate pavement is required on the project then A2 or thicker shoulders associated with that pavement should be set up as a separate alternate and have a LCCA calculated. A3 shoulders are not considered for LCCA’s and should be placed in the roadway category. This example will have 3 sets of alternates. The mainline and ramps will be one set of alternates, the side road would be one set of alternates and the A2 shoulder will be the other. This example will have 2 sets of alternates. The mainline will be one set of alternates and the side road would be the other. The A3 shoulder will be optional in the roadway category. This example will have 2 sets of alternates. The mainline will be one set of alternates and the side and outer roads would be the other. This example will be set up as optional, 401.00-05 Optional Pavement (8”BP vs 7.5”PC) and 401-99.05 Optional Pavement (6”BP vs. 6” PC). 1) Area of Traveled Way - consists of the area within the travel lane (area of new full depth between the pavement markings) for each set of alternates per mix design and binder grade (see the above typical for details). A good check of the calculated traveled way is that the area should be less than the total area of pavement quantity. 2) Total Area of Pavement – Needed for each set of alternates and can usually be obtained from a project’s plans Quantity Sheets or proposal (per mix design and binder grade). 3) Type of Asphalt Pavement Surface Mix (mix design and binder grade). Districts need to supply the information required for completion of the LCCA factors in the transmittal memorandum that is included with the PS&E submittal by the PS&E due date. This will allow time for the Design Division reviewer to check the submittal, send any review comments as necessary and forward a request to the estimator within the time allotted. To ensure there is sufficient time to prepare an accurate LCCA by the due date, a request for LCCA should be submitted to the estimators a minimum of one week prior to the notice with all the required information. This will allow time to receive material quotes, which may take a few days to receive and the use of the most current binder price. Typical sections for both alternates, including station limits, and all side road connections. All pay items for full depth alternate pavements shall be in square yards for the entire pavement. One set of 2B sheets with separate sheets for the items associated with each alternate. Using the "Bidtabs.net" program, the quantities for pavement and other items associated only with the asphalt alternate (designated as "Alternate A") should be designated as "Section 02" and the quantities for pavement and other items associated only with the concrete alternate (designated as "Alternate B") should be designated "Section 03". For A2 shoulders or thicker use "Section 04" for the shoulder type that corresponds with "Section 02" and "Section 05" for the shoulder type that corresponds with "Section 03". This will enable summation of the appropriate subtotals to compile an estimated total cost per alternate. If the project had multiple pavement alternates, the 2nd pavement alternate would be “Section 6” and “Section 7”. For shoulder rumble strips, include the bituminous rumble strip pay item with the asphalt alternate, and the concrete rumble strip pay item with the concrete alternate. Life Cycle Cost adjustment factor is calculated by the Central Office. For projects that the pavement team has provided alternates for base and pavement designs, then the job special provision ALTERNATE TECHNICAL CONCEPT – GRADING, BASE AND PAVING may be inserted to give the contractor base and pavement thickness options. Typical sections for both options, including station limits, and all side road connections. All pay items for optional pavements shall be in square yards and included in the roadway section. For low type pavements (BP) use 401-99.05 and for high type pavements (SP) use 403-99.05. Be sure to use a description what pavement options it covers. Shoulder rumble strips should be paid for by pay item 626-99.09 Optional Rumble Strips per station and be included in the roadway section. The plans should include a note that states that contrast marking will be required for the concrete option at no direct pay. Job Special Provision OPTIONAL PAVEMENTS should be inserted in the Job Special Provisions. For projects that the pavement team has provided alternates for base and pavement designs, than the job special provision ALTERNATE TECHNICAL CONCEPT – GRADING, BASE AND PAVING may be inserted to give the contractor base and pavement thickness options. Subgrade profile and cross sections should be designed for the thicker pavement design. If the thinner pavement design is constructed, the contractor will be responsible for maintaining the profile grade. In the paving project the addition of subgrade material for the thinner pavement design will be paid for as Subgrading and Shouldering, Class 2. Subgrade, profile and cross sections should be designed for the thinner pavement design. If the thicker pavement design is constructed the contractor will be responsible for maintaining the profile grade. In the paving project the removal of subgrade material for the thicker pavement design will be paid for as Subgrading and Shouldering, Class 1. Crossroad structures should be designed to accommodate a minimum cover based on the thicker pavement design. Subgrade profile and cross sections should be designed for the thinner pavement design. The contractor will be responsible for maintaining the profile grade for either pavement design with no direct pay. Crossroad structures should be designed to accommodate a minimum cover based on the thicker pavement design. The core team should always look at pavement options that bring the best value to the project. Consideration should be given to initial construction cost, long-term maintenance cost, and continuity with existing pavement. Also, impacts to local residents and businesses along the route should be considered. Pavements having prevailing issues that make only one type of pavement desirable should be examined to determine the feasibility of alternate bids on pavement. These may include circumstances such as widening existing pavements with safety and durability issues due to differing pavement types in the driving lanes, urban construction, consideration of how the pavement type effects the major item of work for the project (e.g., if major item of work for the project is bridge work the life cycle costs may be insignificant to the total project cost), total amount of paving compared to existing pavement, project staging and project scoping with regard to long-range transportation goals. In unique circumstances, the core team may determine there is a need to specify one pavement type over another on a project. The core team decision, which will include the concurrence of the Pavement Team member and the Design Liaison Engineer, is documented through the Design Exception process. Refer to EPG 233.2.10 Driveway and Approach Pavement Design Criteria. Refer to EPG 450.8 Asphalt Over Rubblized Pavement. Shoulders on urban roadways with access control (major or minor) are to be paved. In no case will a paved or aggregate surface be used directly behind a mountable curb along the outer edge of a roadway. A curb and gutter will only be used with an anticipated posted speed less than 50 mph. Currently shoulder designs are categorized as A1, A2 and A3. Type A1 shoulder design is comprised of asphalt or concrete on a prepared aggregate subgrade placed the same thickness as the mainline pavement. This shoulder type is to be used sparingly, in instances that can be justified such as where there is an imminent need for use of the shoulder as a lane. Type A2 shoulder design consists of asphalt, concrete or roller compacted concrete on a prepared aggregate subgrade with the final surface placed 5 ¾ in. thick. Type A2 shoulders are used on all interstate routes and for major roadways with significant traffic. Type A3 shoulder design consists of asphalt, concrete, or roller compacted concrete on a prepared aggregate subgrade with the final surface placed either 3 ¾ in. thick (asphalt) or 4 in. thick (concrete or roller compacted concrete). This shoulder type is used on major routes (non-interstate only) with relatively lower traffic volumes and on minor routes where a paved shoulder will be provided. For new construction, a paved shoulder is provided on major routes, the full thickness of the travel way pavement should be extended laterally to a longitudinal joint either 1 ft. or 2 ft. outside the travel way. This widening is to extend 2 ft. for interstate and 1 ft. for all other locations. In instances where short segments of pavement are placed, butted at each end by pavement that is not widened, approval may be obtained to omit the widening. Ramp shoulders should be consistent with the mainline. For ramps with integral curbs, the shoulder material and thickness will be specified in the pavement thickness determination. Minor road shoulders should be aggregate stabilized except when maintenance or safety concerns (e.g., edge drop off, high run-off road occurrence) justify an alternate treatment. When conditions warrant, a 1 or 2 ft. lateral extension of the mainline pavement should be considered as an initial option. If paving the remaining width of shoulder is justified, the shoulder should consist of the Type A3 shoulder design. Since the performance and durability of pavement primarily depends upon the support provided by the underlying subgrade materials, it might be said that soil is the most important of all materials used in highway construction. The achievement of an adequate pavement structure requires a close coordination of soil survey, design, and construction to produce the best possible combination of the most economically available materials. The engineering properties of soil, probably more than any other factor, except drainage, influence the service and performance of all types of roads. Soil Surveys. In order that all pertinent soils information be made available for proper design use, soil surveys and cut classification investigations are made by district soils and geology technologists for most projects. Basic soils information which can easily be understood and used by those who have not specialized in soil science is furnished by the Construction and Materials Division. Specific recommendations for cut, fill, and bridge spill fill slopes are contained in soil survey reports. For those projects on which soil survey reports have not been made, such reports with specific slope recommendations are requested from the district construction and materials engineer. Effects of Soils on Pavement Designs. For flexible types of pavement, bases and subbases provide uniformity of support and strength and serve to distribute the load to the underlying soil over an area greater than the contact area of the tire. The weaker or more unstable the underlying soil, the greater is the required area of load distribution, and consequently the greater the required pavement thickness. For rigid pavements, bases provide uniformity of support and a means of preventing pumping. Unsuitable Soils. Unsuitable soils are those which have unstable, non-uniform or otherwise undesirable subgrade support characteristics. Highly plastic clays may have detrimental volume change characteristics (shrink-swell) from removal of overburden or changes in moisture content. This may be a particular problem when encountered in pockets, in varying thicknesses and when transitioning from cuts to fills. Silts are susceptible to rutting and pumping if compacted wet or in proximity to available moisture and may remain susceptible to pumping and frost heave from capillary action after paving. Particular problem materials include the "underclays" found beneath coal beds in Pennsylvanian age strata and gleys or gumbotils often found associated with glacial tills. Differential settlement, rutting and fatigue cracking in pavements is common when these materials are left in the subgrade. The minimum standard treatment of clay soils of moderate plasticity and average volume change potential includes cut compaction and compaction at moisture contents in excess of the optimum in the upper part of the subgrade. Silty soils should be compacted at moisture contents below the optimum. The standard specifications provide for both these measures. Consideration may be given to various forms of subgrade stabilization using chemical (lime, flyash, lime kiln dust, or other) or geosynthetic materials. However, extremely bad materials, such as underclay, gley or pockets of high plasticity clay, should be replaced with select material after being undergraded and wasted or buried in non-critical areas. Importance of Uniformity. Since one key to satisfactory pavement performance is uniformity of underlying support, it is important that subgrades be composed of materials of reasonably uniform characteristics. To achieve uniformity of subgrade support, selection of borrow areas, earthwork balancing, and cross hauling are items which are given consideration including use of contract furnished borrow (embankment in place). Compressible Foundations. Compressible foundations, often encountered in stream bottoms, are normally detected during the soil survey and are referred to the Construction and Materials Division for detailed investigation. This investigation will usually include undisturbed foundation soil sampling, testing and analyses to determine settlement and strength properties. Compressible foundations may be unstable or only marginally stable during the consolidation process and application of embankment loads must be carefully monitored and controlled. Use is often made of restricted loading rates, construction delays, embankment control stakes, pore pressure measurement devices, and flattened or bermed slopes. Where settlements are expected to be high and of very long term duration, vertical sand or wick drains may be used to accelerate settlement but must be used with great care since they may contribute to stability problems. Separate paving and grading projects may be especially helpful in mitigating some of the settlement and stability problems associated with compressible foundations. Transition Zones. Where subgrade support changes from a soil foundation to a solid rock foundation, special precaution is taken to guard against pavement failure. Transition zones of varying depth are feathered out in each direction longitudinally for a distance of approximately 30 to 40 ft. (9.0 to 12.0 m). The transition zone is backfilled with materials specified in the standard specifications for backfilling of undergraded areas. This eliminates or minimizes uneven stresses which may result in pavement failure. Approximate station limits of transition zones are shown on the plans. Pockets of Unsuitable Material. Where pockets of heavy plastic clay or other unsuitable materials are encountered between pinnacles of solid rock, the unsuitable material is removed to required depth and backfilled with the material specified in the Standard Specification for backfilling of undergraded areas. If it is anticipated that such conditions will be encountered, approximate quantities for removal and backfill are shown on the plans. In areas known to have pinnacles of rock, it is extremely important to study the cut classification information in order to avoid large overruns of Class C excavation during construction. A temporary bypass should normally be designed as an optional pavement. The thickness should be determined by the Pavement Section in the Construction and Materials Division, but for scoping purposes can be estimated at 8 inches for Hot Mix Asphalt (HMA) and 7 inches for Portland Cement Concrete (PCC). The optional HMA pavement design should consist of 1 ¾ inches of BP-1 mix with PG 64-22 binder on whatever the required remaining structural thickness is of PMBB PG 64-22. The optional PCC pavement design should be sawed at the tranverse joints, but not doweled. For a bypass duration less than one year the pavement should be placed directly on the subgrade, with the subgrade being compacted in accordance with Sec 203.4 of the standard specifications. 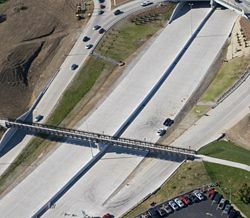 If the bypass is to be used for more than one construction season, i.e., in place over winter months, the pavement may need to be placed on Type 1 aggregate base, compacted in accordance with Sec 203.4 of the standard specifications, over the compacted subgrade. In cases where the bypass pavement will be incorporated into a permanent roadway pavement, the bypass should be designed to the same thickness and alternate type as the proposed pavement. For truck traffic less than 10 a day and if dust can be tolerated, a 2 in. (50 mm) thickness of gravel, crushed stone, or chat may be used for the temporary bypass. The Construction and Materials Division will determine the pavement thickness for all projects on major roads. During early scoping, pavement thicknesses for conceptual design and estimating purposes may be obtained from the ME (Mechanistic-Empirical) Design Table for Project Scoping. For spot improvements, such as widening for turning lanes or for short realignments, a pavement thickness design by Construction and Materials is not always required. The Optional Pavement Design chart below should be used to determine whether or not a pavement design is required. If no pavement design is required, optional pavement choices should still be provided unless there is a valid reason for an exception. The chart includes minimum pavement thicknesses for approaches within 500 ft. of a bridge since that portion of pavement usually will not receive the benefit of future resurfacings. The first 20 ft. of pavement on-grade adjacent to a bridge abutment is always reserved as a bridge design feature. See EPG 503 Bridge Approach Slab for more information. The contractor will be given the option of selecting the material type for the Bridge Approach Slab (Minor) which shall be either an optional concrete bridge approach slab (Min. 12” reinforced PCC) or an optional asphalt (Min. 12” HMA) thickened slab consisting of either bituminous pavement (BP) or Superpave (SP) mix, as determined appropriate for the roadway truck volume. Optional pavement details (pavement type and all lift thicknesses) should be included on the typical section plan sheets. During early scoping, pavement thicknesses for conceptual design and estimating purposes may be obtained from the ME (Mechanistic-Empirical) Design Table for Project Scoping. All selections below should include a 4” Type 1 aggregate base. Aggregate surfaces will not be used except on very low volume or dead end road applications, such as outer roads, temporary bypasses and roadways to be turned over to another agency. In these circumstances an aggregate surface may be appropriate if dust can be tolerated. For these situations a minimum 2 in. thickness of gravel, crushed stone, or chat may be used. Special conditions prevalent within the project area that may affect design consideration. Due date the pavement thickness determination is needed to maintain the project development schedule. Traffic data (construction year AADT, truck percentage, truck classification distribution (if available), and annual growth rate). Soils survey, including data for P.I., gradation, and depth of water table. The district is to request a review of the study for project changes, including (1) delays beyond the anticipated construction, (2) traffic changes, (3) section expansion or reduction, or (4) a revised typical section or other standards revisions, etc. Although final decisions regarding pavement thickness are made by the Construction and Materials Division, the districts may make specific recommendations regarding the principal roadway, outer roadway, service road, or temporary bypass pavement thickness. This page was last modified on 25 January 2019, at 14:55.